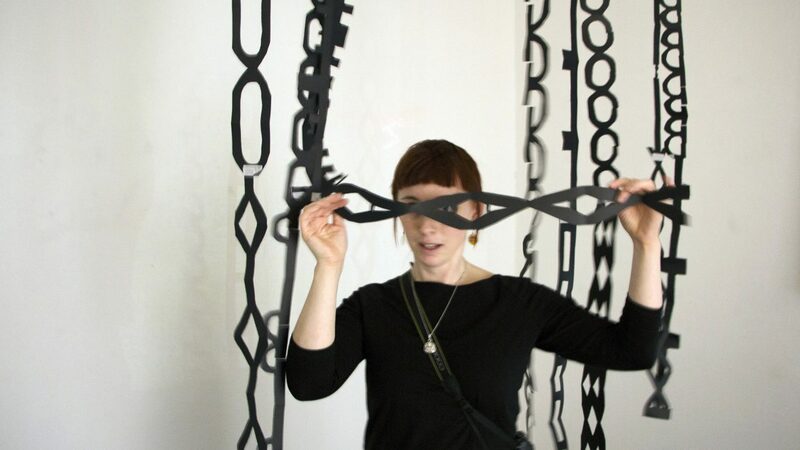 KKV is a shared creative space in Mid-Sweden, just outside Härnösand city centre. We visited it to check out the exhibition honouring World Art Day – an international celebration of the fine arts. 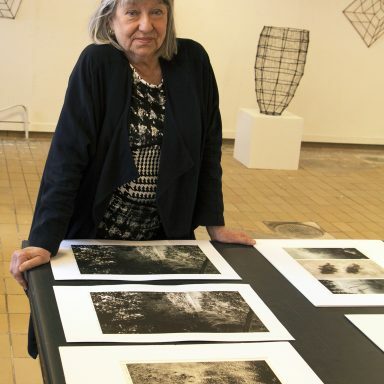 This year, World Art Day was an opportunity for many artists in Härnösand to open their studios to the public and create a temporary art trail around the city. At KKV, the creatives were very busy exhibiting their work. KKV stands for Kollektiva konstnärsverkstan, which could be translated as ‘collective art workshop’. The space was established 1979 by a small group of artists who realised the need for a shared typed of studio in Härnösand. Currently, there are between 25 and 30 creatives at KKV. Gunnel Oldenmark is one of the founders and still works at KKV. 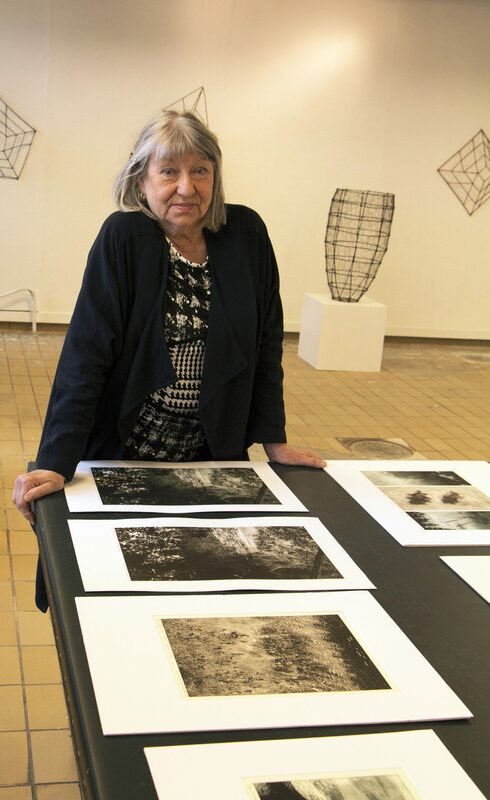 She moved from Stockholm to Härnösand in the late 1970s, and she immediately noticed the lack of shared art spaces: “There was only one place in Umeå in Northern Sweden at the time, but it was difficult for me to go there because my children were very young and I couldn’t travel much”. Kerstin Strandberg founded KKV with Gunnel. 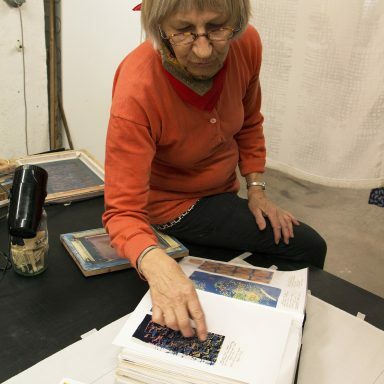 Kerstin is a textile artist who moved from Gothenburg almost 40 years ago. She told us that it took 4 years to get the KKV project going: “We sent many letters around, to get support from the municipality, and we got a response at last”. The municipality has been supporting the project since. The founders transformed communal laundry facilities into studios – the premises were particularly suitable to artists working with textile print, graphics and photography. Nowadays, KKV includes a nice digital workshop with state-of-the-art technical equipment. Gunnel explains that “it would be quite hard to have all this equipment at home; so it is great to be able to share it in a studio like KKV”. In 1979, when Gunnel and Kerstin established KKV, Sandra Mozard was born in Stockholm. 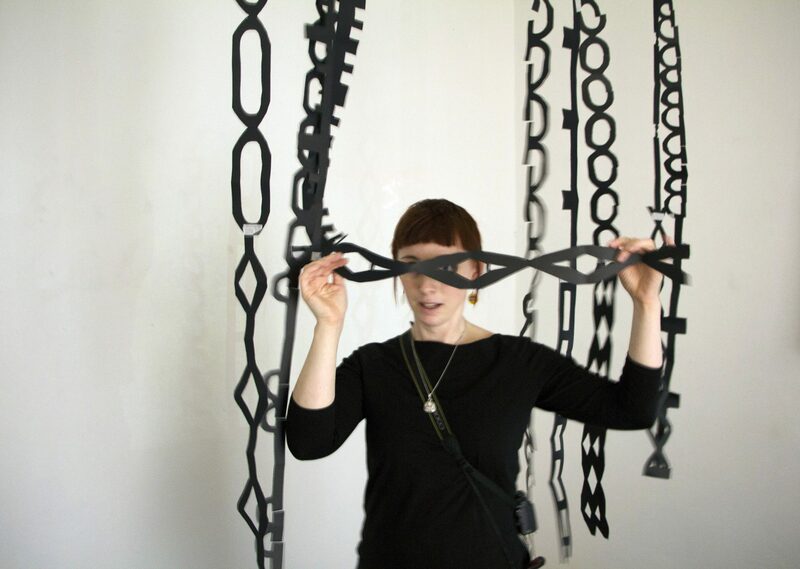 Now Sandra is a KKV resident and, during World Art Day, she showcased her kinetic art. 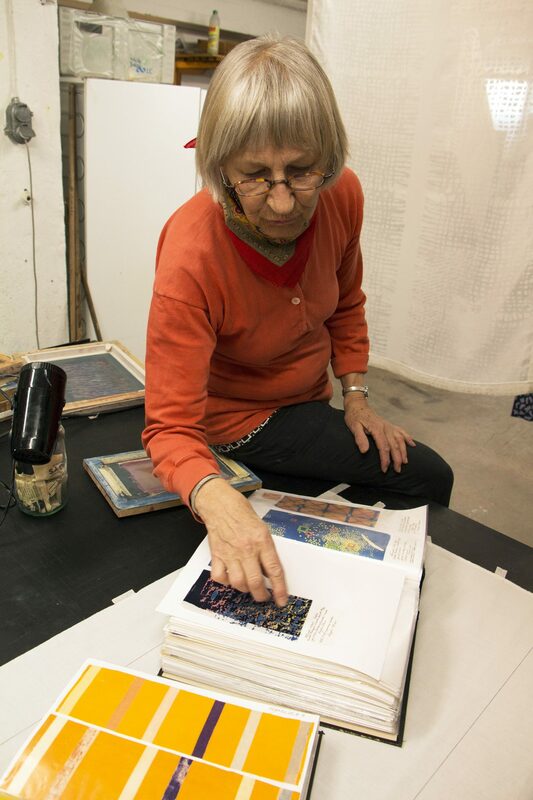 Sandra enjoys working along with other artists, exploring different ways of working, and combining different art forms such as music and the visual art. “When people are part of a team” – Sandra explains –” they can challenge their creative energy and even try to swap roles; this can be quite stimulating”. Sandra often works with children and is determined to increase access to the arts: “To become a free individual, you need to investigate different ways of expressing yourself. It is a lot about identity”. We were simply delighted to visit such an amazing space and get to know Kerstin, Gunnel and Sandra. Hopefully their work will inspire many people in Sweden and beyond!